As reported by World Net Daily, Al Aqsa Martyrs Brigade has been called upon by the Palestinean Authority to help in the protection of Barack Obama in his tour of the Middle East. Al Aqsa Martyrs Brigade is listed by the U.S. State Department as a terror organization. Members of the most active West Bank terror organization are set to serve in security forces being deployed to protect Sen. Barack Obama during his trip to the West Bank tomorrow, WND has learned. Does the fact that a terrorist organization is participating in protecting Barack Obama while in the Middle East give anyone some level of discomfort? The Hamas endorsement several weeks ago was pretty blatant, but does there still remain a question in anyone’s mind that anti-Israel terrorist groups want Obama elected as our next president? Sometime next fall, when you get a call from someone with a foreign accent urging you to vote for Barack Obama, you may consider asking where they are calling from. There’s a good chance it may be the Gaza strip and from a member of Hamas. Palestinians in Gaza have taken it upon themselves to actively campaign for Obama from Gaza. In a world that gets smaller every day through the internet and other forms of communication, this should come as no surprise. However, when pondering whether or not to vote for Barack Obama in the fall, one should ponder this….why would members of Hamas in the Gaza strip attempt to influence our Presidential election? Why are they so preferential to Obama? What is it about him that makes him so attractive to people who belong to terrorist groups and have pledged themselves to the destruction of Israel? Could it be that they think he’s just pretending to be a supporter of Israel and really isn’t? That my friends, is exactly what they think. And I think they’re right. This pro-Obama news video is from Al Jazeera. Hamas, the Palestinian Sunni Islamist militant organization (i.e. terrorist group) and political party has come out in support of their favorite U.S. Presidential candidate….Barack Obama. Hamas’ top political adviser in the Gaza Strip, Ahmed Yousef, said in an interview with World Net Daily and ABC radio that Hamas “hopes” Obama will win the presidential elections and “change” America’s foreign policy. Naturally the Obama campaign ran away from this faster than it did from Rev. Jeremiah Wright a week ago. The only problem for the Obama campaign is the lingering question that will remain in voters’ minds in November. Why would a terrorist organization endorse Barack Obama? Well, if you put yourself in the shoes of the leader of Hamas, what would you want out of America’s next President? 1. A weaker America with less military presence in the Middle East, thus allowing terrorist organizations to freely recruit, raise money, and grow. 2. A weak U.S. economy thus diminishing America’s presence in the world. 3. A more “tolerant” view of radical Islam. 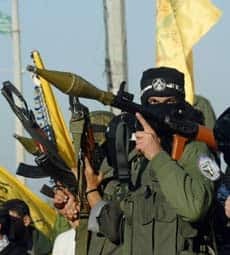 I’m not suggesting that these are Obama’s coming policies, but Hamas clearly believes that they will get more of these with Obama than they do with McCain. It is similar to Al Qaeda’s unofficial “endorsement” of John Kerry four years ago, by Al Qaeda leaders using Democratic talking points on an Al Jazeera released videotape. All organizations (labor unions, religious groups, nonprofit organizations) will endorse who they feel will be in their best interest. Terrorists want what is best for them too! For those of us who aren’t hypnotized by Obama’s empty platitudes of change and hope, this really comes as no surprise. Obama has shown himself to be not only naive, but dangerously naive regarding foreign policy. He has suggested that he would have negotiations with Iran, Cuba, and Venezuela (without preconditions) and has suggested invading one of our allies, Pakistan. He has promised to raise taxes and has promised to immediately start pulling troops out of Iraq. He has promised to levy windfall taxes on American oil companies, which would not only wreck any hope America has of becoming energy independent, but would give foreign oil companies a distinct advantage over American oil companies. Nearly every Obama plan put forth thus far is a potential disaster that could literally take decades to fix once he left office. What better scenario for Hamas and other terrorist organizations to thrive under? A crippled America is in their best interests. By mine and any other sane person’s calculations, Obama already has the perfect plan to accomplish the first three things on the Hamas wishlist. Raising taxes weakens the economy and pulling out of Iraq and Afghanistan weakens our influence in the Middle East. This would allow terrorist organizations to recruit, train, and expand freely. Hamas recognizes that Obama is a member of a church that has remained very vocally anti-Israel and pro-Palestinian for twenty years. Yousef even went so far as to say that Obama is just “kissing up to Jews” because that is “American politics”. There will be much more of this in the coming months. No one issue will derail the Obama campaign, but a combination of the combined controversies of Jeremiah Wright, Tony Rezko, Bill Ayers, and a Hamas endorsement very well could. It just depends on how hungry Americans are for a change in the wrong direction.